Bad news in economic reports continues amidst occasional and one-time positive reports. 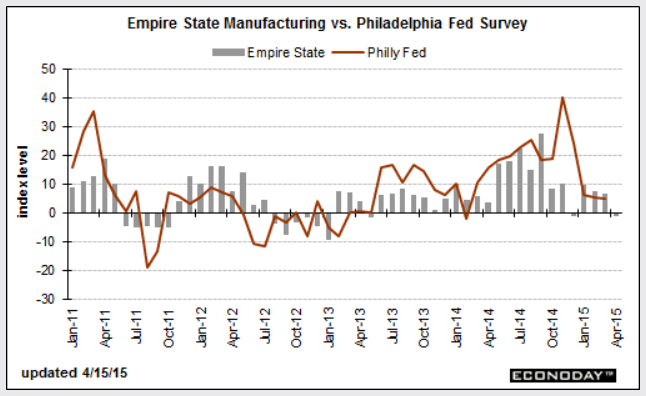 The Bloomberg Empire State Manufacturing consensus was not only overoptimistic. The Empire State index points to month-to-month contraction for April, at minus 1.19 for only the second negative reading in the last 23 months. The other negative reading was in December which was just about the beginning of this indicator's slowdown. New orders are contracting noticeably, at minus 6.00 for the second straight contraction. Weakness in exports, tied to the strong dollar and soft global demand, is a major factor behind the dip in orders. Unfilled orders, at minus 11.70, are in sharp contraction for a second straight month. But the drop in orders has yet to pull down shipments which, at least for now, are still in the plus column and well into the plus column, at 15.23. Employment is also well into the plus column at 9.57 on top of March's standout strength of 18.56. Still, shipments and employment are certain to turn lower if orders don't pick up. But, in an optimistic note, that's exactly what the sample sees as a sizable 52 percent expect general conditions to improve in the next six months. The index has dipped twice without the US economy falling into recession. Unless orders pick up, which I doubt given strength in the US dollar, the third time may be it. 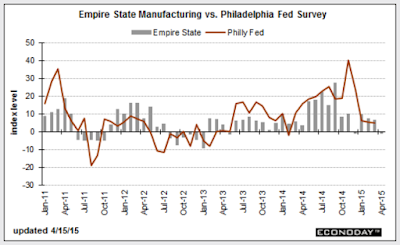 The Philly Fed survey is out tomorrow.